A group of women at St. Mark’s in Moscow have been taking part in an out-of-the-box ministry. They’re using plastic bags from grocery stores to create mats for homeless people to sleep on. Diane Kanavy decided to start this ministry after seeing information about it online. “The whole thing started because I saw on the internet where a group of church ladies were making sleeping mats for the homeless out of plastic grocery bags,” said Kanavy. “I checked out some YouTube videos and it looked interesting.” Inspired by these stories, Kanavy began recruiting other women at St. Mark’s and the idea began to gain traction. Kanavy says there are now about a dozen “Bag Ladies” who are helping to make the mats. The mats are made out of “plarn” created by stringing plastic bags together. The plarn is sturdier and lasts longer than traditional yarn, and makes use of plastic bags which might have otherwise been discarded. So far the Bag Ladies have provided 15 mats to the Scranton Rescue Mission. The ministry was meant to be temporary, but the Ladies have decided to continue it after seeing the impact their work is making. “We were going to stop, but the last time we took some down, a gentlemen told one of the ladies that the mats are great, that he has one, and he hopes we’re going to keep making them. So that squashed the stopping idea,” said Kanavy. 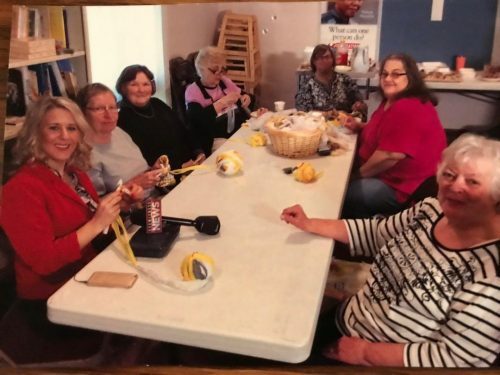 The Bag Ladies have also helped others get involved in making plarn mats for the homeless. Kanavy says there is now a larger group at Conyngham Methodist Church creating mats and donating them to a Catholic relief organization. If you’d like to get involved in this ministry or start a group of your own, Kanavy can be contacted via email.